The 4th World Schools Championship 2008 attracted 258 players from 24 countries of which about half, some 115 came from Singapore (of its neighbours, Indonesia had 37, Malaysia had just 3 but the again Brunei and the Philippines had none!). Organised by the Singapore Chess Federation, managed by Intchess Asia, and co-hosted by Teck Ghee Community Club, the event had 11 categories - Open 17, Open 15, Open 13, Open 11, Open 9, Open 7, Girls 15, Girls 13, Girls 11, Girls 9, and Girls 7 - so a total of 12 individual and 11 team gold medals were up for grabs. With the largest contingent and especially in the categories where other countries were under represented, Singapore was always going to win the bulk of team medals but the question was how many individual medals would they actually get with their junior development program? In the end, Terry Chua in the Open 17 and Daniel Chan in the Open 15 did the host country proud with great fighting performances to become Singapore's latest World Schools Champions. The Singapore players generally dominated these two categories, and several others had their chances to win too but still all credit must go to these two who after losing their way early showed great determination and put together a string of wins against their main opposition to emerge the gold medalists on tiebreak. Young Nathan Mar in the Open 7 was horribly unlucky to miss out by losing out through the narrowest of tiebreaks and so failed to emulate compatriot Derek Lim's ground breaking championship performance in 2006 when he became their first ever World Champion. I was the Deputy Chief Arbiter, but also served (with many others) as a kind of Tournament Director/Assistant Organiser, ensuring buses left daily on time with most of the players, arranging to taking care of minor medical needs, finding lost bags (on occasion even a missing player), looking into things like hall air conditioning, barriers, etc. and ensuring clocks worked, there were sufficient scoresheets and that the pairings were up and the bulletins printed and distributed on time. 1. Teck Ghee Community Club proved to be just right for this size of event, the hall fitting all participants comfortably, and the facilities there made the parent's "wait" more pleasant that in most similar events (the only complaint perhaps being a shopping mall next door would be so much better than a food court!). 2. While there was free wireless broadband access thanks to Intchess Asia's ASEAN Chess Academy also being located in the same premises, with 4 official hotels in 3 locations, maybe taking advantage of modern communications to more aggressively publish pairings (even making it the only option) might have been the way to go. Finally, I would like to put on record my thanks to Executive Director Thomas Hoe the Singapore Chess Federation for putting me up at Hotel Royal where the very professional staff there also proved that service and hospitality is still very much alive in Singapore! 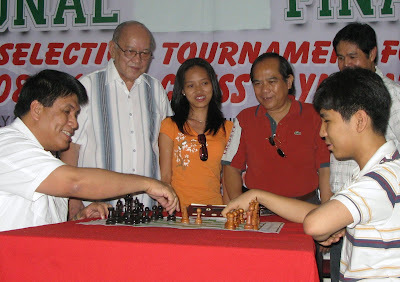 From my previous post, my readers would have gathered I was recently in Manila where amongst other things I witnessed the start of the Philippine National Championship Finals which also serves as their qualifier for the 38th World Chess Olympiad. On getting back home I started taking a harder look at the emails I was viewing there via Blackberry Connect and started inking in the events I might be involved in and the list just grew and grew! Just look at the above. From Deputy Chief Arbiter in Singapore during the World Schools, I would have to immediately switch to being a FIDE Trainer in Botswana. Then after a week it would be from 16 August to 31 October 2008, literally 6 tournaments, many back to back (opens, games, and championships) in more than two months, where I would likely be either part of the organising team and/or arbiter! Some 10 days later (probably just catching up on sleep!) going to the Olympiad in Desden, but in what capacity is probably another story by itself! After all these, coming home at the end of November would be very nice indeed. While there is also a number of big events immediately following including the 1st Korea Open, and Singapore Opens, and whether I am involved or not, and at what level, I will certainly be celebrating Christmas with my family!